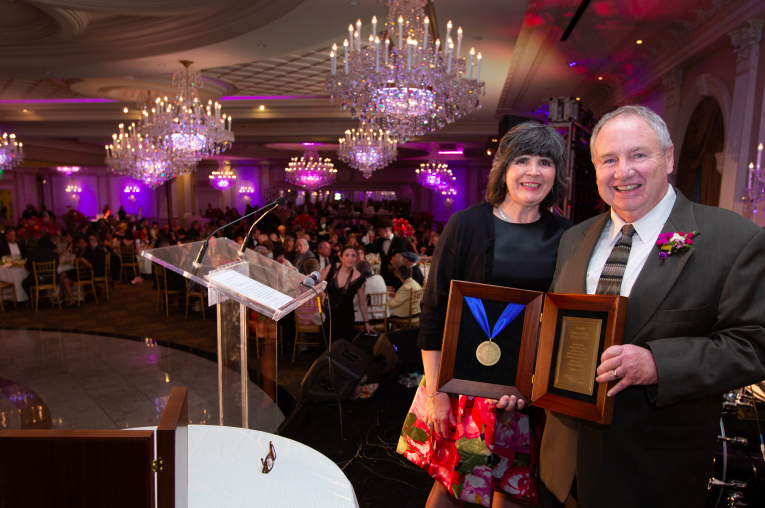 Good Samaritan Hospital, a member of the Westchester Medical Center Health Network (WMCHealth) recently held its 33rd Annual Spring Ball and celebrated honorees, Cary Hirsch, MD, and Chestnut Ridge Transportation. Approximately $300,000 was raised at the ball to benefit Good Samaritan Hospital. Proceeds will help the hospital further invest in state-of-the-art facilities, leading-edge technology and innovative services. The nearly 450 guests in attendance at the gala, held on April 13 at The Rockleigh, included healthcare providers, community leaders and friends of Good Samaritan Hospital. Two distinguished honorees are recognized each year at the Spring Ball. Dr. Hirsch received the Sister Joseph Rita Award for Medical Excellence and Chestnut Ridge Transportation was presented with the Good Samaritan Hospital Medal of Honor. Dr. Hirsch is Medical Director, Active International Cardiovascular Institute; Co-Director, Good Samaritan Hospital Cardiac Catheterization Laboratory; President, Good Samaritan Hospital Medical Staff and President, Metropolitan Cardiology Consultants. Chestnut Ridge Transportation, part of The Trans Group, has supported Good Samaritan Hospital for many years. The company provides transportation for The Arc Rockland and public school students, including students with special needs, to and from school in multiple districts throughout Rockland County. For more information about the Good Samaritan Hospital Foundation, please call 845.368.5151 or visit https://www.bschsf.org/goodsam/.